I was incredibly intrigued when we were asked to review a wooden bath toy; we are massive fans of all wooden toys but this is the first time that I had heard of one for the bath! As soon as I saw the Plan Toys Activity Sailboat I knew it was going to be a hit with Lucas, in fact we even had a little play with it before bathtime! I had told Lucas it was his boat to go in the bath and come bathtime he trotted off to get it to bring upstairs with us. While I’m running the bath he’s chattering away and this is probably my favourite thing about this bath toy; Lucas has been slow developing his speech so any toy that encourages him to use language is fantastic. He was telling me all about the boat with the sail and the turtle, shark (fish) and star – a real testament of how this toy encourages imaginative play. It’s a boat (any kind of vehicle is always welcome). It is a totally different bath toy. It is non-toxic and sustainable. Lucas chatters away when he is playing with it. It is such a beautiful wooden toy. Plan Toys have released a whole range of wooden toys all finished with a special waterproof coating to make them perfect for bathtime. The Activity Sailboat is a lovely wooden boat that comes with a fisherman, a starfish, fish and turtle, a hook to go fishing with and a cabin and sail. It is available from The Toadstool priced £30.00. I actually think it is good value for money especially when I think of all the plastic bath toys I have bought Lucas that have easily broken or gone mouldy and had to be thrown away. I can see this boat lasting a long time; it has already leapt into the position of favourite bath toy and quite often one of the little figures comes with us out of the bath. It feels very sturdy and well made but best of all my little boy was instantly attracted to it and it has already given us so much happy play at bathtime. If you would like to hear more please join me and take part in the Toadstool twitter chat on 23rd January 8pm-9pm using #toadtest. Disclaimer – We were sent the Plan Toys Activity Sailboat to review as a Toadstool Ambassador. All opinions are always my own. That has to be the best bath toy I have ever seen! It looks so fun, practical and not as likely to mould as plastic/rubber toys. I really love it! We really love it too, I couldn’t imagine a wooden bath toy but this is great and I’d definitely get more from the range! It is fab! We have had so much fun with it already. It was bigger than I thought too and feels very sturdy. 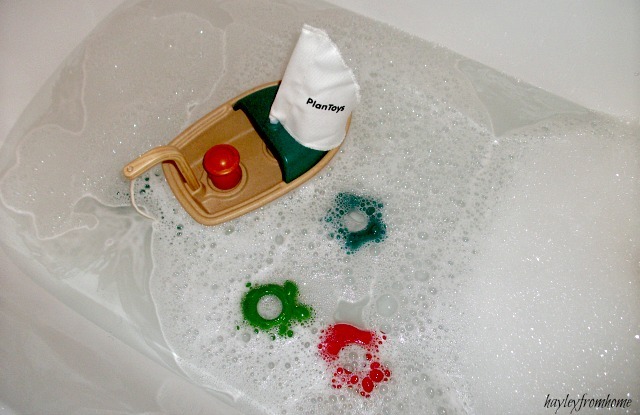 It’s a big plus not having to worry about any mould – drives me mad with our plastic bath toys! Um, this looks brilliant. Good bath toys are hard to come by so will have to check this out I think.